WAIST HIGH: The Alarm: VH1 Bands Reunited. 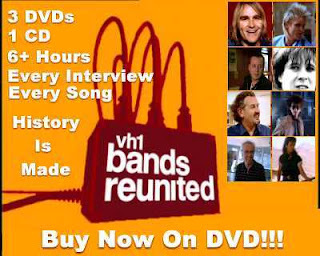 The Alarm: VH1 Bands Reunited. The complete recorded footage of the events leading up to the concert, held in London in October of 2003, and the full live gig are now available on a 6 hour 3 DVD Set plus Bonus Audio Disc. The DVD features the complete Alarm Reunion Concert plus extensive footage of all the ambush sequences together with every interview given during the course of the program by Mike Peters, Eddie Macdonald, Dave Sharp and Nigel Twist. Over 6 hours of unseen footage, including a behind the scenes film of the original Alarm performing for first time in rehearsals leading up to the gig, and the complete group interview during which The Alarm confront the events that broke the band back in 1991. Also included are hours of programming as The Alarm are followed by cameras every step of the way towards an emotional reunion live on stage with their fans in London on October 28th, 2003. "And heroes are exactly what they are. It strikes me at that moment, that this is one of the amazing things about these guys. Offstage, whenever I have talked to any of them, they are normal down-to-Earth people. But when they get together on stage and make music, something magical happens. The Alarm is the sum of its parts. An amazing chemistry exists when all four are on stage together, and as they return for possibly their final performance together, I stand in awe - amazed that these four people can still move me as much as they did 20 years ago."